Disney took the next step to bring Frozen everywhere Tuesday by teaming up with Google and launching its Disney Movies Anywhere service on Android. The launch makes it possible for consumers to watch Disney movies purchased on iTunes on Android devices, and also brings the Disney Movies Anywhere app to Android phones and tablets. The end goal of [company]Disney[/company] Movies Anywhere is to “show the value of digital ownership,” as Disney CTO Jamie Voris said during an interview. In other words: Disney wants you to keep buying its movies, even if you have long said goodbye to the physical disc. Here’s how Disney Movies Anywhere works: Consumers who have previously bought a Disney movie on iTunes, or at some point gotten hands on one of those discs that comes with a “digital copy” coupon code, can now link their [company]Google[/company] account with their Disney account (and yes, an ESPN account will work as well). After that, any digital purchase of a Disney movie made through iTunes will also show up in Google Play, and vice versa, provided that the iTunes account is also linked to Disney Movies Anywhere. In addition to this, Disney is also launching its own Disney Movies Anywhere app on Google Play, something it also did on iOS when it announced a similar partnership with Apple earlier this year. The iOS and the Android app largely offer the same features, save for one detail: On Android, the app also supports Chromecast, letting you beam the movies to the TV screen. 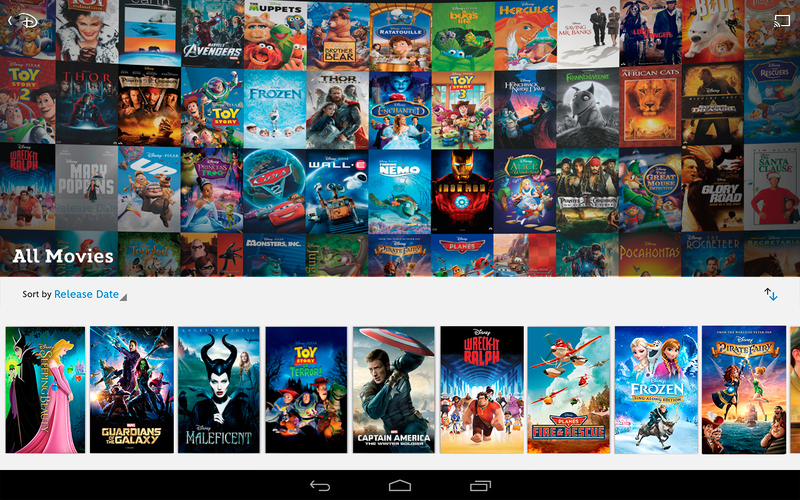 The Disney Movies Anywhere app on Android. Of course, you could also do the same thing with the Google Play Movies app, but Voris told me that the Disney app has some exclusive features that set it apart from iTunes and Google Play. One is chaptering, which allows viewers to jump to different parts of the movie just like in a DVD. The other one is free short-form content that is not available anywhere else. There is also a loyalty program for people who are into this kind of thing, as well as the ability to resume a movie at the right spot on a different device, and Voris said that Disney may launch additional second-screen features in the future. Disney isn’t the only company trying to bring some interoperability to digital movie purchases. Sony, Warner Bros, 20th Century Fox and Universal launched a competing cloud music locker dubbed [company]UltraViolet[/company] more than three years ago, but Disney decided to not join those efforts and do its own thing instead. “The good news is that we are both trying to solve the same problem,” Voris said when asked about UltraViolet. He added that there are some conceptual differences between the two services, which include that Disney has its own app on iOS and Android. Also, UltraViolet doesn’t have any partnerships with Apple or Google, at least not yet. The common goal of bother services is to get consumers to keep spending $15 or $20 a pop for movies, instead of waiting for them to appear on Netflix or Amazon Prime Instant. Voris argued that digital ownership and subscription services can be complementary. I’m not so sure about that — most people seem perfectly fine just watching movies via subscription services, or renting them once and then never watching them again. Only in the USA. C’mon play nice! Thanks to the new Google Play Roku app, Disney Anywhere now works on Roku as well. That’s pretty awesome. Yeah. But it still stinks that everything comes to iOS months before it comes to Android.